Worried about treating that cold while pregnant? A new study shows you might be overly concerned. We hear so much about the dangers of everything we put into our bodies during pregnancy. Although much of that concern is well-placed—some things we know we shouldn't do, like smoke—it's possible we've become a little too cautious. A recent study published in the International Journal of Clinical Pharmacy looked at pregnant women's attitudes toward taking medicine, and found many stayed away from drugs that are considered safe. Even more concerning, some even avoided treating urinary tract infections (UTIs), which can have harmful effects on a fetus. Are any meds completely safe? Researchers studied questionnaires completed online by 1120 pregnant or recently pregnant women to gauge their views on meds during pregnancy—as well as if they actually took them—for common ailments like colds, nausea, heartburn, headache, constipation and UTIs. 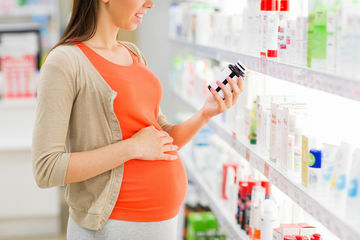 "Many women [72 percent] stated that they avoided medicines during pregnancy," study author Michael Twigg, PhD, of the School of Pharmacy at the University of East Anglia in the UK, tells Fit Pregnancy. "However, some of the medicines that were avoided or viewed as 'risky' may actually be safe for them to take." These include paracetamol (called acetaminophen in the U.S., the active ingredient in Tylenol), as well as antibiotics to treat UTIs. Taking any medication, especially during pregnancy, involves weighing benefits and risks. Even "safe" medicines can be called into question because doctors simply don't have enough information—after all, scientists can't run randomized studies on pregnant women. "It is always better to take as few medicines as possible during pregnancy," Twigg says. "Many of the common conditions experienced during pregnancy can be treated by changing your diet or lifestyle." In this study, few women took meds for constipation, nausea or sleeping problems, likely because they were able to relieve their symptoms in other ways. But, that doesn't mean you should never take medicine during pregnancy. "The choice of which medication to use should be based on clear advice from a healthcare professional rather than avoiding medicines that are relatively safe to use," Twigg says. For example, avoiding Tylenol might not be a good idea if you have a fever, because fevers may negatively affect a developing baby and lead to birth defects. Likewise, UTIs should definitely be treated—although in this study, 35 percent of women who had a UTI avoided doing so. Twigg says this large number was the "most important finding" of the research. "If left untreated a UTI can get worse and cause further problems in your kidneys which, rarely, can lead to effects on the unborn child," he says. These complications include preterm labor and low birthweight—so in this case, taking the drugs is worth avoiding the infection's potentially harmful impact. So why are many women still reluctant to take medications during pregnancy? It doesn't help that the official guidelines on the topic are pretty vague. "The recommendations need to be vague so that they apply to all women at whatever stage of pregnancy they may be at," Twigg says. "I don't think they need to be clearer—women just need to know that they can get more personalized advice from a healthcare professional such as a doctor or pharmacist." Even so, results of the study show that pregnant women might not be getting all the info they need. "Nearly 50 percent of the women in our study said they wanted more information about medicines," Twigg says. If your doctor hasn't provided you with guidance, ask. "The best advice is if you are unsure about whether you can take a medicine for a particular condition, speak to your midwife, pharmacist or GP," Twigg says. "This will ensure you are not putting your child at risk while at the same time not suffering unnecessarily yourself." With all the uncertainty about medications' side effects, it's no wonder women are hesitating to take them. "When it comes to the safety of your unborn child I think women are right to be cautious when using medicines," Twigg says. "Each woman should feel comfortable discussing her concerns with a healthcare professional in order to find an appropriate treatment that she is happy with."